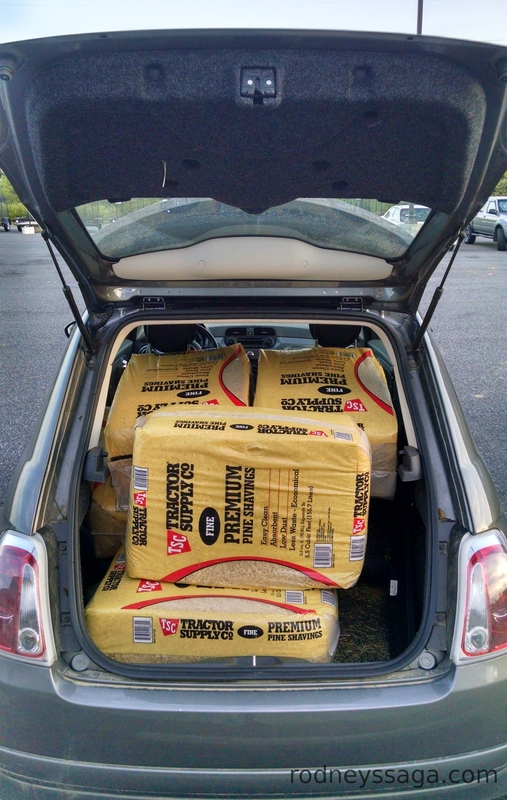 Six bags of shavings in a Fiat 500. How long does it take to use a bag? My stall cleaner says 1/2 bag a day when the stall was occupied at night, a full bag when Rodney & Milton were hot-sheeting. As for how long it takes to use – about 5 minutes. Apparently there is something irrestible about peeing on clean shavings. This was a one-off while the stall was in temporary use. Rodney & Milton are now out in the field. When the stall was regularly used, shavings came via the larger car or the truck. Yes, good compost. Eventually. We use it to fill eroded areas. When we did FEI three-day events, we always found that the fastest way to cooperate with the AHSA sample collectors was to take the horse out of the stall, bed it with fresh shavings, and bring the horse back. The sample collector was gone within five minutes, with sample.